(AP) KANSAS CITY, Mo. 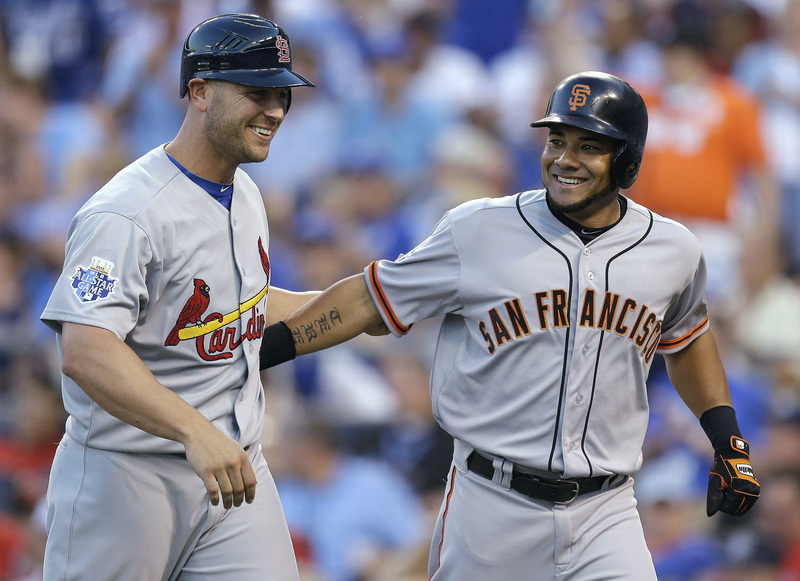 - Pablo Sandoval and Melky Cabrera turned the All-Star game into a Giant blowout. Flashing their bright orange spikes and booming bats, the San Francisco sluggers keyed a five-run blitz against Justin Verlander in the first inning that sent the National League to an 8-0 romp over the American League on Tuesday night. Cabrera homered and won the MVP award, and Giants teammate Matt Cain started a strong pitching performance for the NL in its most-lopsided All-Star victory. Cain combined with Stephen Strasburg, R.A. Dickey, Aroldis Chapman and the rest of a lights-out staff on a six-hitter. "San Francisco Giants show," Matt Kemp of the rival Dodgers said during the game. Ryan Braun, an All-Star again after his drug suspension was overturned last winter, doubled, tripled and made a fine catch in the outfield to help give the NL its first three-game winning streak in two decades. Chipper Jones singled in his final All-Star at-bat at age 40 as the NL, under retired manager Tony La Russa, once again claimed home-field advantage in the World Series. Teen sensation Bryce Harper had a shaky All-Star debut. Fellow rookie Mike Trout, only 20, showed off his dynamic skills. The game was pretty much decided a few moments after it started. Sandoval hit the first bases-loaded triple in All-Star history off Verlander, who couldn't control his 100 mph heat. Cabrera singled and scored the first run, then hit a two-run homer against Matt Harrison in a three-run fourth. "I don't get many triples," said the slow-footed Sandoval, known as Kung Fu Panda. "We had some fun with that in the dugout." Rafael Furcal also hit a three-bagger, making the NL the first league with three in an All-Star game. As the All-Stars returned to Kansas City for the first time since 1973, La Russa bid a fond farewell to the national stage in the city where he played for his first major league team. Having retired after managing St. Louis to last year's World Series title, La Russa became just the fourth inactive manager to skipper an All-Star team and improved to 4-2. The NL boosted its advantage to 43-38-2 and won for just the third time in the 10 years the All-Star game has been used to determine home-field advantage in the World Series. La Russa's Cardinals benefited from last year's NL All-Star victory, with St. Louis winning Games 6 and 7 at home against Ron Washington's Texas Rangers. Jones, retiring at the end of the season, also had one last All-Star moment, pinch hitting in the sixth and singling just past second baseman Ian Kinsler and into right field. Jones chuckled as the ball rolled through. "Whether you're 19 or 40, we are all equals here," Jones said during his pregame speech to the NL. Harper, at 19 the youngest position player in All-Star history, had a shaky start when he entered in the fifth. The heralded rookie, wearing shiny gold shoes, didn't flash a Gold Glove and lost Mike Napoli's routine fly to left in the lights, allowing it to drop behind him for a single. He then caught Kinsler's bases-loaded flyball to end the inning, earning cheers from the crowd of 40,933 at Kauffman Stadium, spruced up by a $250 million renovation that was completed three years ago. Harper did draw a walk and tagged up on a long fly, but later got himself hung up in a rundown and tagged out. Trout, among a record five All-Star rookies, had a nice showing against two very different pitchers. The Angels outfielder singled and stole a base against Dickey's knuckleball, then drew a walk against Chapman and his 101 mph heat. Cain pitched the 22nd perfect game in big league history last month. He didn't have to be perfect in this one, allowing one hit in two innings for the win. "For those guys to go out and score five runs in the first inning was definitely a little more relaxing for me," he said. "But I still tried to stay focused." Cain was followed by 10 relievers, with Jonathan Papelbon getting the last out with a runner on third base. Verlander had a puzzling outing. In games that count, he hasn't allowed five runs in an inning since April 2010, according to STATS LLC. He became the first All-Star to give up a five-spot since Houston's Roger Clemens in front of his hometown fans in 2004. "It was pretty difficult for me to get the ball down today," said Verlander, who admitted he approached this differently than a regular-season start. In a 35-pitch inning, he threw five pitches clocked at 100 mph and another at 101. "But I had fun," he said. "That's why I don't try to throw 100 in the first inning. But this is for the fans. It doesn't usually work out too well for me." A crowd clad in red, white and blue T-shirts cheered during pregame introductions for hometown star Billy Butler, who dropped his cap when he tried to wave it. Fans booed the New York Yankees' Robinson Cano, who angered local fans when he bypassed Butler for Monday night's Home Run Derby. Not since Game 7 of Kansas City's 1985 World Series over the Cardinals had the baseball world descended on the Royals' ballpark, a rare 1970s beauty known for its 322-foot-wide fountain in right and the 105-foot-high scoreboard topped by a crown. Cabrera, a former Yankee, singled with one out in the first and scored on a double to deep right by Braun, the reigning NL MVP. Verlander threw six straight balls during consecutive two-out walks to Carlos Beltran and Buster Posey. Wearing shiny gold-and-orange spikes for the occasion, Sandoval sent a drive off the base of the wall in the right-field corner for a 4-0 lead. He scored when Dan Uggla grounded to the shortstop hole and first baseman Prince Fielder failed to come up with Derek Jeter's one-hop throw, leaving Uggla with an infield hit. After Furcal tripled to right, pinch-hitter Matt Holliday singled for a 6-0 lead and Cabrera followed with a drive into the left-field bullpen. Dickey, a first-time All-Star at 37, was given a big ovation. He pitched a one-hit sixth, hitting Paul Konerko on a shoulder with pitch. Although he has a big league-best 12-1 record, Dickey was denied the start  possibly because of the difficulty of catching his knuckler. He brought along an oversized glove from Mets catcher Josh Thole that was used by Carlos Ruiz, who replaced Posey behind the plate in the sixth. "I really appreciate the warm reception by the fans in Kansas City. Maybe a lot of them have heard my story," Dickey said. NOTES: The NL extended the AL's scoreless streak to 14 innings  its longest drought since 1995-97. ... The NL won for just the sixth time in a quarter-century. The NL had last won three straight in 1994-96. ... It was the first All-Star shutout since the NL's 6-0 win in 1996 at Philadelphia.